LongIsland.com - Your Name sent you Article details of "Festive Fun, Tree Lightings, The Holiday Light Show, News & More in November 30th's Newsletter!" The holiday season is upon us - here's the best ways to welcome December this weekend! This weekend, November comes to an end, and we enter December - which is quite arguably the most festive, and anticipated month of the year for many. With many getting a head start on Holiday Shopping this year, it seems that the Season is already in full swing - homes are being decorated, trees are being lit, and Long Island is already enjoying the holiday spirit. This weekend, there are countless tree lighting ceremonies, holiday craft shows, and the Girl Scouts of Suffolk County's Holiday Light Show begins! Over the next few weeks, there is all sorts of seasonal excitement, including the Nutcracker Ballet, Menorah Lighting Ceremonies, and all sorts of indoor & outdoor experiences celebrating the season of giving. The forecast is looking good for the next week or so, so get out there, and enjoy the season, Long Island! Don't Miss the Performance of the Season at Hofstra University! Frank Ohman’s New York Dance Theatre presents its 30th season of the holiday classic “The Nutcracker” at Hofstra University on December 10, 11, 17, 18 (six performances). Ohman’s production is the largest Nutcracker on Long Island with added music, scenes, and dances, and has a cast of eighty children, semi-professional dancers, and professional guest artists. Holiday family entertainment at its best…come experience the magic! For more info & to purchase tickets, please visit their website, or call 631-462-0964 or 888-695-0888. Tis the Season to Enjoy Holiday Splendor! The official start of the holiday season is when Santa Claus stopped in Herald Square at the end of the Macy's Thanksgiving Day Parade. This week the tree in Rockefeller Center will be lit. You can save a trip into the city by watching it on television. Or stay local as nearly every town on Long Island has its own special tree-lighting tradition. We even have a tree that is next to an ice-skating rink. Get into the spirit of the season with your neighbors at these events. Some towns offer free hot chocolate with musical performances and joyous caroling. Others offer a special appearance of Santa Claus and reading of “'Twas the Night Before Christmas”. Don't forget to bring your camera. Many are also accepting new toy donations - give back this season as you enjoy the Holiday Magic! 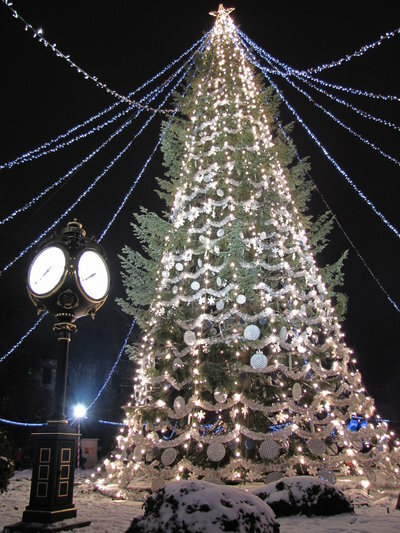 Read this Article in Full on LongIsland.com to Find a Local Tree Lighting Ceremony! Making sure that your home, car, and business have the proper insurance coverage is vital for a quick recovery after disaster strikes - something that many Long Islanders learned after Superstorm Sandy. Denis A. Miller Insurance is here to help - their knowledgeable agents can help you find the right coverage for all of your needs - they specialize in problem solving, and are experts in dealing with tough insurance issues. They have successfully filed over 5000 flood claims out of their Long Beach office, and this is why they are home of "The Floodman." Flood Insurance is especially important for home owners on LI - there are many low lying areas that are prone to flooding, and this coverage is vital to protect your home, car, and valuables. If you do not already have Flood Insurance, give Denis A. Miller Insurance a call for a free quote today - it takes 30 Days for Flood Insurance to go into effect, so you want to be sure to stay on top of it! Are you a Homeowner that received FEMA Assistance as a result of Superstorm Sandy? You'll be required to purchase Flood Insurance for your home - let the experts take care of it, and rest easy knowing that everything you've worked hard for is protected, and backed by the best - Denis A. Miller Insurance. For more information & a Free Quote, please visit their website, or call 516-432-9245. Do you love belting out your favorite tunes? Check out Karazee Karaoke Kares this Friday at 7PM at Grafton Street Pub! Karazee Karaoke & the Grafton Street Pub are teaming up for an evening of fun and fundraising to benefit the Suffolk County Coalition Against Domestic Violence. Come on out to sing for a cause and show your support! All proceeds will go to the SCCADV. This event is free to attend but there is a $2 donation for each song you sing. It’s that time of year again, get ready for the holidays! Head on down to the Westhampton Beach Chamber of Commerce for their Holiday Winterfest in the Village with Tree and Menorah Lighting this Saturday from 12-6:30 PM! Featuring a visit with Santa, horse and buggy rides, stories with Mrs. Clause and more this will be a fun day for the whole family! Ending with the Christmas Tree & Menorah Lighting at the Gazebo with Interfaith Carolers, Santa arriving a on WHB Fire Truck, and Complimentary Hot Cocoa and Cookies this will not be a day to miss! If you love Santa, breakfast, and fun games, then head out to the Make-A-Wish Breakfast with Santa this Sunday at Dave and Buster’s Islandia from 9-11AM! 15% of all proceeds from ticket sales go to the Make-A-Wish Foundation and 100% of all stars sold will be donated as well! Don’t miss out on the chance to give back while having a ton of family fun! Please call for tickets. Everyone on Long Island was affected by Hurricane Sandy. Help those who are still in need by attending An Evening of Relief: Wining and Dining to Benefit Victims of Hurricane Sandy this Monday from 6:30-9:30 PM! Hosted by The Carltun, More than 50 of Long Island's best restaurants and vineyards will be featured! Raffles, silent auctions, prizes, toy and coat drive and live music by Hurricane! Tickets are $75-$90. Help those who need it most and have a wonderful evening! This holiday season, bring the family out for an unforgettable experience at the 9th Annual Holiday Light Show, presented by the Girl Scouts of Suffolk County at Camp Edey of Bayport. Open every day now, through December 30th (closed December 24th & 25th for the Holiday), from 5PM - 9PM, the Holiday Light Show features tens of thousands of dazzling lights, with numerous exciting holiday displays. At the end of the Light Show, you can warm up in the Holiday Village with some hot cocoa and snacks, meet Santa, and visit the Hall of Trees. Admission is $12 per carload Monday - Thursday, and $15 per carload Friday - Sunday - a great way to entertain the whole family on a budget. Proceeds will benefit the Girl Scouts of Suffolk County, and their numerous programs & community outreach services - so why not enjoy some holiday cheer this year while supporting an amazing local organization! Don't miss this beloved holiday tradition this year - come help the Girl Scouts celebrate the holiday season at the 9th Annual Holiday Light Show! For ticket information, check out the Event Listing on LongIsland.com, or call 631-472-1625!